For a comprehensive evaluation on how Vesselucida 360 can meet your research needs, we invite you to consult with one of our MBF Bioscience staff scientists. Visit https://www.mbfbioscience.com/vesselucida360 for more information about Vesselucida 360. 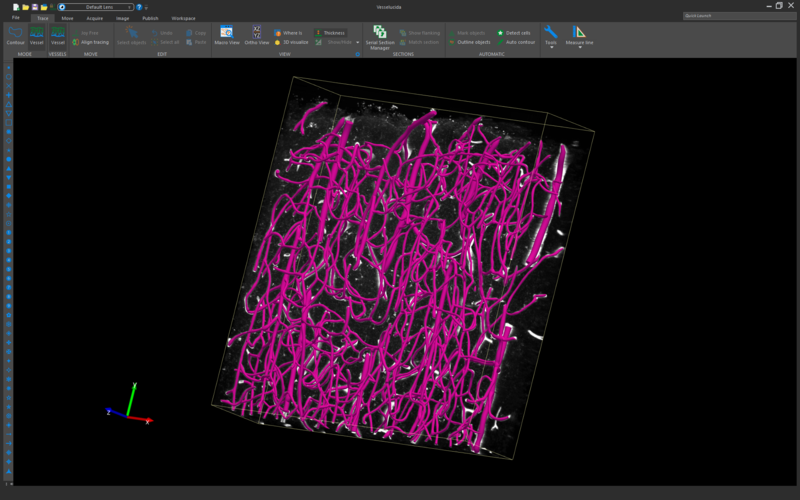 MBF Bioscience creates quantitative imaging and visualization software for stereology, neuron reconstruction, vascular analysis, c. elegans behavior analysis and medical education, integrated with the world’s leading microscope systems, to empower research. Our development team and staff scientists are actively engaged with leading bioscience researchers, constantly working to refine our products based on state-of-the-art scientific advances in the field. Founded as MicroBrightField, Inc. in 1988, we changed our name to MBF Bioscience in 2005 to reflect the expansion of our products and services to new microscopy techniques in all fields of biological research and education. While we continue to specialize in neuroscience research, our products are also used extensively in the research fields of stem cells, lung, kidney, cardiac, cancer, and toxicology. MBF Bioscience has grown into a global business, with offices in North America, Europe, Japan, and China, and a dealer network active on five continents. Our commitment to innovative products and unrivaled customer support has gained high praise from distinguished scientists who use our products all over the world. Our flagship products Stereo Investigator and Neurolucida are the most widely-used analysis systems for stereology and neuron reconstruction.